Georgia - This is Wikie. She’s the first killer whale ever to be recorded imitating human speech. José - The point here is that we didn’t want to teach English or a language to the killer whale. Georgia - That’s study author Jose Zamorano Abramson from the Complutense University of Madrid. So why did they do it? José - Vocal imitation is a hallmark of human spoken language. It’s very important in the evolution of human culture. We think that studies in other species has revealed that the ability to copy sounds from other members of their own species among primates is mostly unique in humans. José - Most biologists think that these dialects are acquired non-genetically - they are probably by social learning. José - First we found that killer whales made recognisable copies of novel sounds of killer whales and even human sounds or words - they did it quickly, so we found they are flexible, open, vocal learners. They have the capacity for vocal learning and for vocal imitation. Our results are also remarkable if you think that there was no extensive trial and error training. The sounds were presented in the air and not in the water so it was a very artificial medium for her. Also, the sound production system greatly differs from humans’. They use another vocal structure than humans so it’s remarkable that she was capable of copying our human sounds. José - We support with these results the hypothesis that dialects of certain natural populations are learnt by imitation, which means that these dialects can be seen as vocal traditions or cultures. If they have, by vocal traditions, cultures and dialects are an important part of these traditions, dialects can also serve like a social function like accents, for example. 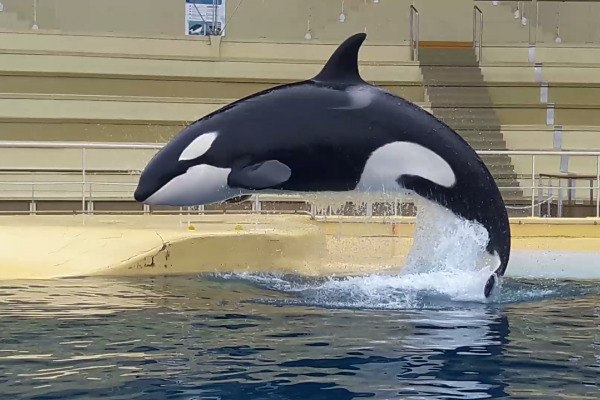 Killer whales can differentiate where are the members of their group or from other families just by the dialects, and they can announce cooperation, for example. José - You know that if you capture a killer whale or other animals that rely on social learning and some animals are very important for their social knowledge. You can have a lot of damage if you took or you kill the animals that have the knowledge because different animals play different roles in the social structure. The same thing happens when the killer whales are in captivity, you can’t release a killer whale that is captive in the ocean because she relies on social learning. So you really need to teach that killer whale the special culture, dialects or the way they hunt, or whatever, to introduce them if it can be introduced. Previous Could microbes munch our waste plastic?